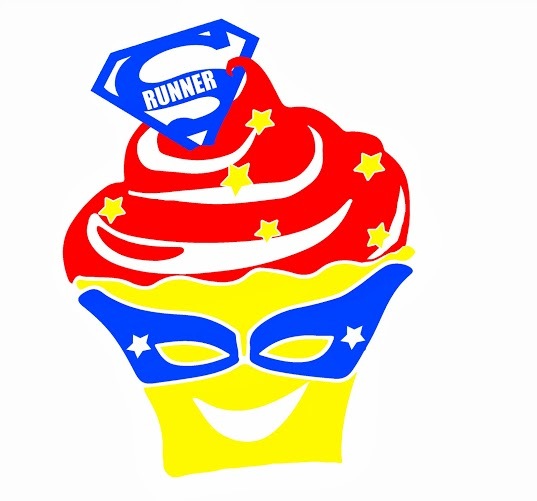 Registration is now open for our latest cupcake virtual run! It's hard to believe that a year ago I partnered with Run Find your Happy Pace to bring the first cupcake virtual to reality and here we are a year later! The cupcake virtual races (and the pumpkin virtual) have raised over $11,000 for Team in Training! That is an amazing amount and I thank all of you that have participated or shared our events! Now, how can you earn the latest adorable cupcake medal???? We will be following the same honor system that we've had in place for all of our virtual races. This means that you register for our race and then run your race when you have the time. We will have an 'official' race day of August 31, 2013. But, you are welcome to do the race any time before or after! You choose your distance, place, time of day, all of it! The SuperCupcake medal will be a 2 1/2" diecut medal and the yellow will have glitter. This is the final design for the medal, it has been approved by our medal production company. There will be a limited quantity available for this medal, and registration will remain open until capacity is reached. There will be updates placed on my Running in Sanity Facebook page and also the Cupcake Virtual Runs for Charity Facebook page. Because this is a diecut medal, it does take time to get it produced from our production company. Medals will not be mailed until approximately August 21. But, do not delay in registering- the only way to guarantee your spot is to register early! To register you must have a PayPal account, and use the PayPal link to the top right of this page. Registration will be $20 for United States participants and $25 for international participants. All funds raised from the SuperCupcake virtual race will be donated to the Leukemia and Lymphoma Society through Team in Training. Thank you for helping me reach my fundraising goal for the Tinker Bell Half Marathon! Where do we register for a distance?